This is an old family recipe from Czechoslovakia. 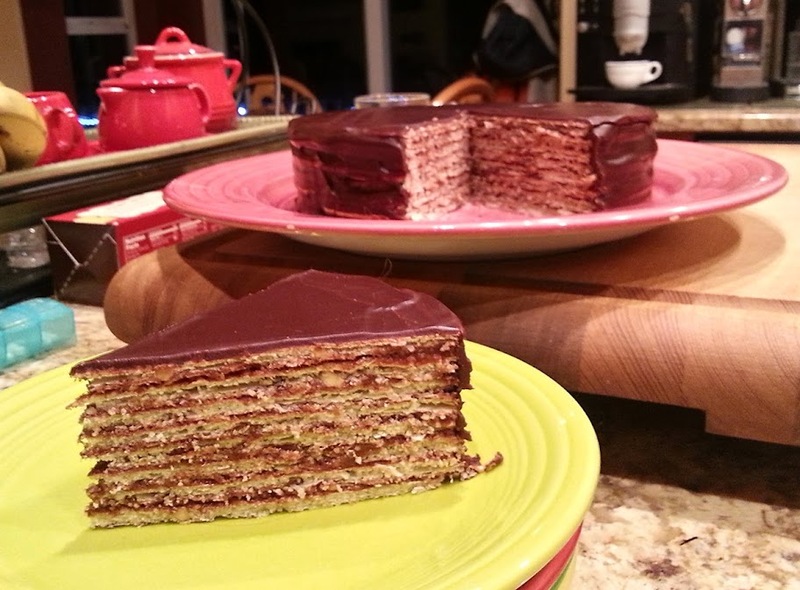 From what history I can find, it looks like the Pishinger Torte dates back about 150 years. It's Austrian in origin and consists of very light crisp Oblaten wafers filled with a chocolate-coffee-almond mixture, and covered in a chocolate glaze. I went on a hunt for these wafers last year (discussion thread here) and was able to get them this year at Edelweiss off Powell. If you make this, the trick is to not put gobs of filling in between the layers, and it turns out to be a very light and not too sweet chocolate torte. The wafers are paper thin, light and crisp..."wafers" that are 2 wafers with sugar and ground almonds in the middle. - Let chocolate mixture cool slightly then add to butter mixture a little bit at a time. Do this by hand with a whisk or rubber spatula. Add ground almonds and mix by hand to incorporate. Batter should be slightly stiff / spreadable. If not, refrigerate for about 5 minutes. - Spread a thin layer of this batter on one of the Oblaten wafers. Cover completely. Lay another Oblaten wafer on top of the first and spread a thin layer of batter on top. Keep doing this until you have no batter remaining. Place a final Oblaten wafer on top. You should go through about 1 and a half packages of the wafers. - Melt the remaining 4 oz of chocolate with 4 Tbs water. Whisk until smooth. Stir in the 1 Tbs butter until melted and smooth. Let cool slightly. - Pour chocolate mixture over top of the torte and sides. You may need to let it cool a bit more to be able to "frost" the sides and make a smooth layer on top. Don't make the top layer too thick. - Serve immediate or refrigerate uncovered for 10 - 15 minutes to set the chocolate, then cover with plastic wrap. Slice with a thin sharp knife.